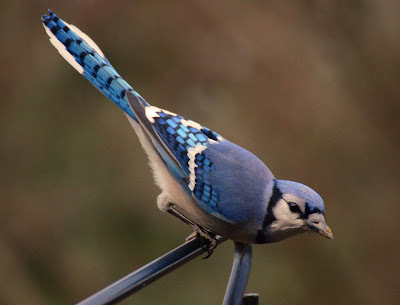 Brash and bold, a Blue Jay swoops in to disrupt the ebb and flow of lesser birds at the feeder. Cut these extroverted corvids some slack, though - the avian Johnny Appleseeds play a major role in reforesting our oak woodlands. Bird feeding is big business, and brings birds up close and personal to people who might not otherwise notice them. Nearly everyone who tacks up suet blocks or sprinkles sunflower seeds have seen the Top 10 most common feeder birds in Ohio. It’s an interesting list, and each of these birds has a story to tell. Their roles in our lives go far beyond brightening the backyard, and in this talk we’ll explore the rest of the story. The venue is the lovely Inniswood Gardens, and the price of admission can't be beat - it's free! Hi! Found your blog when I searched for "Yellow Cardinals". Yep...I have one in my backyard. Check out my blog if you want to see photos (although not very good ones).